With training camps across the NHL set to open by this Saturday, at the earliest, the Sabres will be bringing in plenty of familiar faces to be evaluated for the 48 games that will be played in 2013. Unlike a traditional training camp and preseason, this abbreviated version will keep the position battles to a minimum and many roster spots will go to the usual suspects. This is particularly good news for some veterans who may have otherwise had to claw for a spot on the 23-man roster and this also eliminates the ability for youngsters to make a statement as to if they belong in Buffalo for the duration of the season. With every team in a similar situation, there is bound to be a league-wide struggle with chemistry. The teams that will be successful will be those who adapt and overcome any issues they have once the season gets going. The biggest struggle, outside of chemistry and fitness, will be those teams that hit any sort of losing streak. With a shortened schedule against conference foes, wins and losses will be magnified and any streak will be magnified that much more. As the Sabres look to take advantage of the shortened season and build on an interesting offseason, here are a few questions that will likely have an impact on the season. How do the Sabres handle the 48-game schedule? The Sabres have become notorious for mid-season slumps and losing streaks that shake the team to the core. While new personalities have been injected into the locker room, there are many who will be asking how the Sabres go about finding success with this season. Should the Sabres get off to a slow start, they will be facing a difficult uphill battle to remain in the Eastern Conference playoff hunt. Many have joked that they hope the January 19 start date isn’t in the middle of the Sabres mid-winter slumber but part of the joke is somewhat true. The Sabres can’t afford to sleep on any games and will need to get off to a quick start and hopefully cement a playoff position by doing so. How will the lines and pairings shake out? One thing that can be assumed is that most of the roster spots will already be determined heading into camp. Cody Hodgson and Tyler Ennis will likely be Buffalo’s top two centers while Steve Ott and Cody McCormick center the bottom six. Thomas Vanek, Jason Pominville and other holdovers like Drew Stafford, Nathan Gerbe and Ville Leino will also have their spots all but sealed up. The same can be said of most of Buffalo’s defensemen; Tyler Myers, Robyn Regehr, Christian Ehrhoff, Jordan Leopold, Andrej Sekera and Mike Weber can all expect to have some role with the big club this season. Where exactly these players shake out is an entirely different question. Dealing with injuries may also affect how Ruff chooses to form his roster, as the Sabres may try and keep additional reinforcements in Buffalo in the event that injuries strike the team hard and fast. With such a short season, the injury bug could have particularly devastating results on any team. There are two x-factors in the form of TJ Brennan and Mikhail Grigorenko here. Brennan’s success this year should almost certainly warrant him a spot with Buffalo’s top seven defensemen. However, Alex Sulzer and Adam Pardy will also be in the mix. While Pardy is probably destined for waivers and then Rochester, Sulzer may be kept around. Sulzer’s strong play to close out 2011-12 is something that likely stuck with Lindy Ruff and I’d be very surprised if he isn’t among the top six of seven defensemen used by the Sabres this year. As for the forwards, the Foligno/Ennis/Stafford trio was electric last season and could already be penciled in amongst Buffalo’s forwards. Finding wingers for Cody Hodgson and possibly even Grigorenko will fall between Vanek, Pominville, Leino and Gerbe. In addition, Ott, McCormick, Matt Ellis, Pat Kaleta, John Scott and even Kevin Porter will be siphoned off to the bottom six or even just the fourth line. Don’t forget about Luke Adam who has also enjoyed something of a resurgence with a return to center in Rochester. Exactly how Ruff distributes the talent on this roster will be an interesting decision to track. Particularly if Grigorenko sticks around. Does Mikhail Girgorenko crack the lineup? Grigorenko is fresh off a strong World Junior Tournament –one in which many commentators said he out-shined his teammate Nail Yakupov. Grigorenko has spent the last four months lighting up the QMJHL and if he has added some strength, he could make for the top-line center the Sabres are desperate for. He will be at camp and will have the opportunity to make the team. While this isn’t a practice that Lindy Ruff seems to enjoy, I think he is at least deserving of a nine-game look. Give Grigorenko nine games between viable wingers like Vanek, Pominville, Leino or others with scoring ability to see what he brings to the table. If after nine games he hasn’t justified a spot, send him back to junior and let him debut in the fall. For what its worth, having Grigorenko center Vanek and Pominville while allowing Hodgson and Ennis to center the team’s other offensive wingers seems like an enticing option. What current Amerks remain on the Sabres roster? TJ Brennan certainly seems like a shoo-in as the first defenseman up from Rochester should injuries hamper the Buffalo blueline. The crowded house that is the Sabres defensive corps is difficult to sort out and I don’t think Brennan would be served well in an eight-man unit. However, his impressive play has likely made an impact on the staff and should give him an opportunity to stick for the regular season. I’m working on the assumption that Adam Pardy is shipped to the AHL and Alex Sulzer serves as the eighth defenseman to start the year. That could place Brennan in the seventh slot and he could rotate in and out with Mike Weber depending on the lineup Ruff hopes to use on a particular night. Other current Amerks who will certainly remain in Buffalo will be Cody Hodgson and Marcus Foligno, but they were considered to be shoe-ins whether or not the season started on time. Keep an eye on Luke Adam and Kevin Porter as others who are currently skating with the Amerks who could make the jump now or down the line this year. How does Lindy Ruff use his goaltenders? Not sure if you heard, but how Lindy Ruff rotates Ryan Miller and Jhonas Enroth has been a contentious point over the past few years. Funny enough, the Bills just dispatched a coach who couldn’t rotate his running backs well and Buffalo fans will get a full dose of a coach who can’t rotate his goaltenders. However, I think the abbreviated season will actually benefit Ruff as he will be forced to stick to his schedule, particularly early on in the campaign. Ensuring that Miller is kept fresh over what is sure to be a condensed season will be vital and using Enroth more than one every two weeks will be the only way to combat this. If Ruff isn’t able to spell Miller properly, the Sabres will be in a bad spot later in the season. How will the Sabres fare this season? There needs to be some sort of concern about the makeup of the Buffalo roster. There is certainly a chance that should Girgorenko stick around that the center position would be significantly stronger than it stands now. However, when I look at the roster I’m not overwhelmed by any particular position. 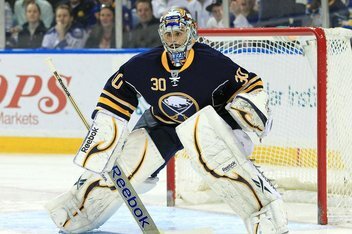 Only needing Ryan Miller for half of a season should be very beneficial and could certainly help the playoff chances for the Sabres. What I’m waiting on is where the scoring will come from especially if the top six or nine forwards can indeed find quick chemistry. I think a realistic expectation will be a finish somewhere between four and six in the East if the Sabres are indeed a playoff team.